We excel at post-production audio and music for film, TV, games, and the web. Soundtracks, commercials, corporate video, sound design, voice over and scene spotting are all in our scope. See our work below, including the critically acclaimed feature film “Icons Among Us,” the Cannes short-form winner “Electric Roots," and the animated feature "Strange Frame," starring Tim Curry and George Takei. "Court Metrage" Cannes 2014. Washington Hill Picts. K. Hill Dir. Rap photographer John Mannion and The Game discuss their work. Artist focus video for the fine audio gear company. Gracenote - Manifesto Jay Blakesberg Dir. An employee messaging video for new hire onboarding. Made for Gracenote India. We mixed this feature film at Skywalker w/ Gary Rizzo. Premiered at Lincoln Center NYC. Blended analog synthesis and conventional FX for this fun team building video. Feat. Celebrity Chef Roy Choi at the Culinary Institute in Napa, CA. Private vid, email us for immed access. HD Animation and motion graphics by Lucky Devil partner Lumen 3D. Pepsico holds their annual partner summit at Google/Twitter HQ. Private vid, email us for immed access. A news app product introduction video for the web. Millions of folks streamed this PayPerView promotional video on ATT/Uverse. Across our 18 years, we’ve been honored to work with a broad spectrum of fascinating clients: corporations, small businesses, TV and film studios, powerhouse agencies, independent filmmakers, large bands, theater groups, and solo musicians. All bring in unique needs and expectations, and we’re proud to say every client has been satisfied. Recorded with some of the Bay Area's finest musicians, including Tower Of Power Horns, Eric McFadden, Jon Evans, and the amazing Reggie Watts. The 1st record by the inimitable Bay Area electronic explorers, Materialized. Made at LDS. Mixed by the great Oz Fritz (Bill Laswell, Tom Waits). The 2nd record by Materialized. Initially released on 180gr vinyl (Buy Vinyl). Tracked/produced by Dave Pellicciaro. Mixed by Oz Fritz. Materialized crush their 3rd recording. Huge, edgy sound. Produced by Dave Pellicciaro. Released on Tallest Man Records. Mixed by Oz Fritz. Audio for toys presents a surprising and unique set of technical challenges that we love taking on. For example, the Rooftop Collectibles’ “Rudolph the Red Nosed Reindeer 50th Anniversary Set” project below required re-recording classic orchestration, casting/producing voice talent to sing the songs and bring the characters to life, and finally mixing and compressing all audio to sound its best coming out of a small toy speaker. Back to the Music section. This week at LDS we're putting the finishing touches on a raucous set of new toys for Rooftop Collectibles. After the the wildly successful Rudolph the Red Nosed Reindeer 50th Anniversary Series we are back this round for a set of Candidate Punching Judy dolls! In the last couple weeks we mixed the pilot for the TV series "Clouds". This full Oakland production is the first-time effort and brainchild of two very bright guys, Theo Hollingsworth and Obatala Mawusi. The past few months I've been working on a few projects with internationally acclaimed rock photographer, author and video producer Jay Blakesberg. Everyone in the industry uses essentially the same tools—you come to Lucky Devil Sound for the results. Here your project is fostered through the production process in our solid, positive style to convey the impact you expect. And yes, for feature film soundtracks, theatrical mixes, broadcast audio, corporate video, and mixed-media audio for games, mobile, or the web, Lucky Devil Sound uses the most current technologies for the finest one-stop production service in the Bay Area. Lucky Devil Sound specializes in the full range of music composition, production, post-production and licensing services for the film and TV industries, agencies, corporate clients, bands—and yes, the mighty individual. Owned and operated by keyboardist, composer, synthesist, producer, arranger, engineer, and title hog David Pellicciaro (aka Mighty Dave), the Lucky Devil studio comfortably facilitates the entire production process in-house. Between Dave’s broad, seasoned expertise, the studio’s cutting-edge gear, and access to world-class voice talent and musicians of all instruments, styles, and specialties, Lucky Devil is uniquely suited to see your vision through, perfect your project, and give you peace of mind. It’s crucial to us that the directors, businesses, agencies, and artists we get to work with — like BMW Motorcycles, ESPN, NPR, Bayer, Africa Channel, Cisco, PBS, Reebok, The American Red Cross, and Roche — walk away happy every time. And they do. Lucky Devil Sound is credited with multiple production awards, including the Northwest Film Festival 1st Place Award, the Halo Award, the Golden Gate Film Institute 1st Place Award, and the 1st Place Seattle International Film Festival award for the music composed/produced for the short film "Fortune Hunters." Dave has a BFA in Music (Jazz Piano Major) from Cornish College of the Arts in Seattle, where he studied under jazz greats Julian Priester, Hadley Caliman, and Jerry Granelli. He is well-known for pushing his modified Hammond organ to its limits, and creating gigantic electronic sounds and beats with his drums/keys duo Materialized. He wrote and produced the solo disc "Short Goodbyes - The Permanent Collection," featuring such fine guests as Mic Gillette (trumpet / Tower of Power), Karl Perazzo (percussion / Santana), Reggie Watts (Singer), and Jon Evans (Bass/Tori Amos). As a keyboardist, he auditioned for the Grateful Dead and has been similarly summoned by Black Crowes, Chris Isaak, Gov’t Mule, and Col. Bruce Hampton. Dave has played, jammed, and/or sat-in with a long list of friends, including: Widespread Panic, Gov’t Mule, Taj Mahal, Galactic, Dirty Dozen Brass Band, Critters Buggin’, Mike Clark, Leftover Salmon, Particle, Will Bernard, George Porter, and a whole lotta others. His mix of “Icons Among Us - Jazz in the Present Tense,” a two-hour feature film and four-hour TV series, is permanently ensconced in the Smithsonian. “Icons” premiered at Lincoln Center, and became an AFI opening-night selection touring the world with AFI selections. Dave produced, mixed (including the final mix at Skywalker) and arranged the score for the sci-fi anime film “Strange Frame,” starring George Takai, Tim Curry, Tara Strong, and Claudia Black — which garnered Best Feature Film at the 2012 Dragon Con. In 1996, he formed one of hardest-working rock bands of the modern era, The Jackmormons, with Jerry Joseph. He played and produced the band’s first two CDs: "Butte Mont, 1879" and "Cotton." At High Sierra Music Festival in Quincy, California, Dave hosted five years of “Mighty Dave’s Pandora’s Box” as well as the hugely popular Keyboard Playshop, featuring among others Marco Benevento, Robert Walter, Melvin Seals, Joe Russo, Dan Lebowitz, Will Bernard, and Reggie Watts. He co-created and is Musical Director of the Bay Area's annual Cosmic Love Ball party and showcase, hosting featured guest artists such as Dave Schools (WSP), EOTO, Derek Trucks, Paolo Baldi ( Les Claypool), and Brian Jordan (Lauren Hill, Snoop Dogg). 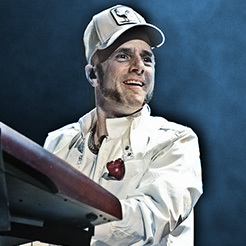 Dave’s currently the keyboard player and producer of the high-energy live electronica band Materialized, with Dale Fanning (Living Daylights) on drums and guest Carlitos del Puerto (Springsteen, Max Weinberg, Herbie Hancock, Stevie Wonder) on bass. He’s co-written, produced and tracked/mixed three records for Materialized at Lucky Devil Sound: "Songs About Music," "Magneto Delicti," and "Space Junk." Lucky Devil Sound is located in beautiful Oakland, California. Got it - thank you! We'll get back to you within 24 hours.